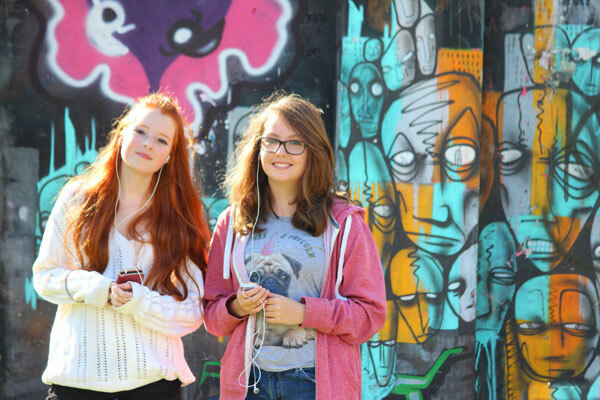 This photo shows us standing in a playground, next to a wall of awesome skull graffiti, with blue, grey, pink and orange colours. Local graffiti artists are allowed to spray paint the walls in this particular playground, and so the images often change on a regular basis. We liked this photo so much that we decided to use it as our main logo and pick out the colours in the faces to theme our website. This is one of our earliest photoshoots and shows the wall behind in the shade, while we are standing forwards with the sun shining from the left, creating an interesting mixture of light and shadows. And of course, we are listening to music with our headphones in, holding our trusty mobile phones.